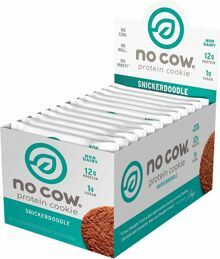 Protein Blend (Brown Rice Protein, Pea Protein), Almonds, Palm Oil, Water, Glycerine, Chocolate Chips (Cocoa Liquor, Soluble Vegetable Fiber (Corn), Cocoa Butter, Natural Flavors), Soluble Vegetable Fiber (Corn), Oat Flour, Erythritol, xanthan Gum, Natural Flavors, Baking Soda, Salt, Stevia Extract, Monk Fruit. Protein Blend (Brown Rice Protein, Pea Protein), Palm Oil, Almonds, Water, Glycerine, Chocolate Chips (Cocoa Liquor, Soluble Vegetable Fiber (Corn), Cocoa Butter, Natural Flavors), Soluble Vegetable Fiber (Corn), Cocoa (Processed with Alkali), Erythritol, Natural Flavors, Oat Flour, Xanthan Gum, Baking Soda, Salt, Stevia Extract, Monk Fruit. Protein Blend (Brown Rice Protein, Pea Protein), Palm Oil, Peanut Butter (Peanuts, Salt, Palm Oil), Water, Glycerine, Peanuts, Soluble Vegetable Fiber (Corn), Erythritol, Oat Flour, Peanut Extract, Xanthan Gum, Natural Flavors, Baking Soda, Salt, Stevia Extract, Monk Fruit. Chocolate is good. Double is better. Rich cacao and chocolate chips give you a one-two punch of chocolaty goodness. Oh, and you're getting 12g of protein with just 1g of sugar, so it's a win-win all around. Contains Almonds. Produced on equipment that also processes soy, peanut, milk, egg and other tree nuts.